Frozen spinach makes this creamed spinach dish easy to fix, and Parmesan cheese, a little garlic, and a hint of nutmeg flavors it perfectly. I used frozen spinach in this dish. If you use fresh spinach, use about 2 pounds (trimmed). 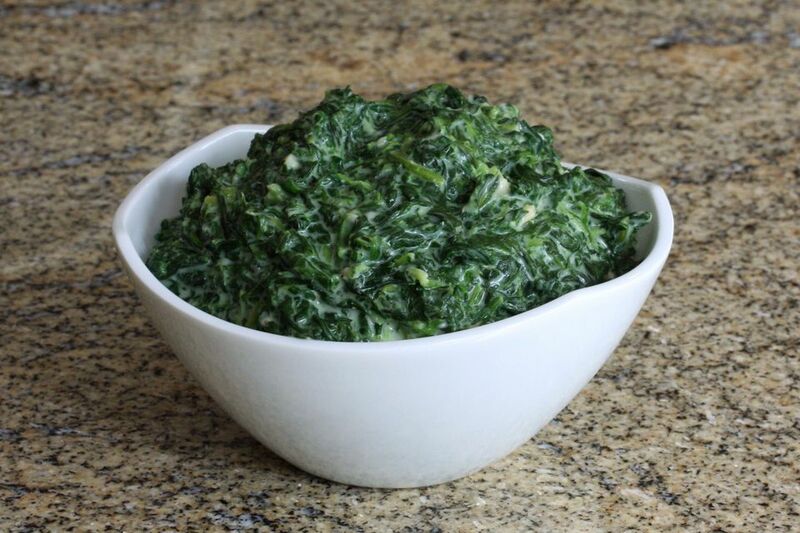 This creamy spinach side dish is one you'll make again and again! Thaw the frozen spinach in a colander and squeeze it with your hands to get as much moisture out as possible. Set aside. In a saute pan or saucepan over medium heat, melt the butter. Add the minced garlic and saute, stirring, until it is softened and aromatic. Whisk the flour into the butter and garlic; stir until blended. Cook, stirring, for about 1 to 2 minutes. Add the milk and cook, whisking constantly, until thickened. Add the spinach and Parmesan cheese and then add the nutmeg, salt, and pepper, to taste. Continue cooking over low heat, stirring constantly, for 5 minutes, or until spinach is tender and hot. With Shallots: Melt the butter in the saute pan over medium heat; add 1 medium chopped shallot to the butter. Cook for about 3 minutes, until softened. Add the minced garlic and continue with the recipe. Gluten-Free: Use 2 tablespoons of sweet rice flour or masa harina in place of the flour in the roux.